Jinx: Anatomy of an SDCC Exclusive | The Fighting 1:18th! Hot on the heels of both Sgt. 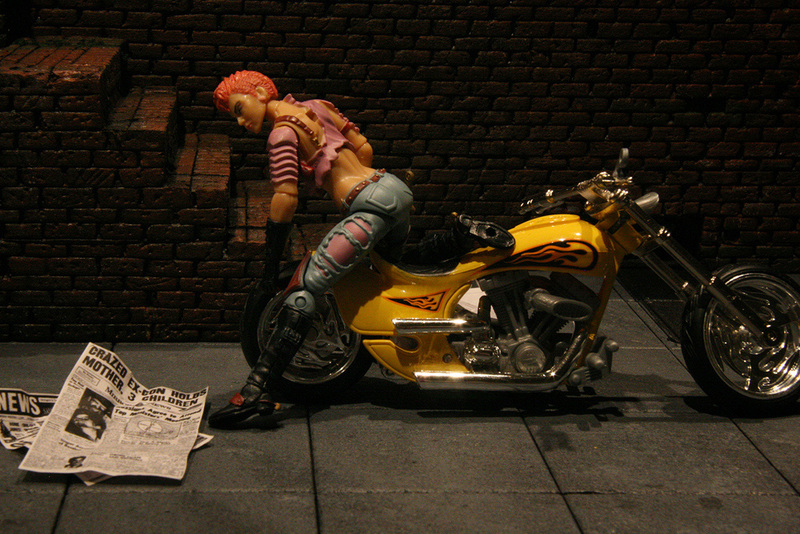 Slaughter and Zarana, fans found out at Toy Fair earlier this year that the 2012 SDCC G.I. 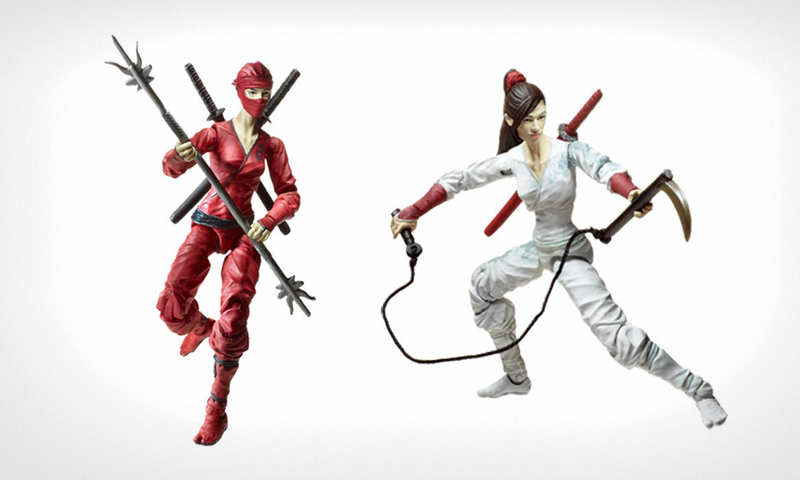 Joe Exclusive would be the red-clad female ninja, Jinx. Just a few days ago, we finally saw the first glimpse of the card art in the form of leaked samples from China. As always, the overseas samples stirred up a cruel hybrid of excitement and gnashing of teeth among the collecting communities as they await the chance to either get her at the Convention for retail price, or pay ridiculous prices on the secondary market to obtain her as non-attendees. Each year the exclusives have more and more commotion surrounding them as rabid fans prepare for the unavoidable frenzy to add them to their collections. But why? Ever since Hasbro launched the G.I. Joe “25th Anniversary” line in 2007, we’ve seen a San Diego Comic Con grace the line each year with a limited edition exclusive figure that collectors have scrambled to own. 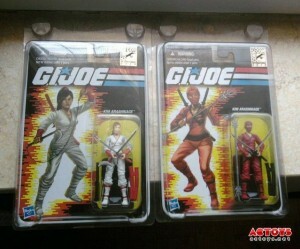 Each figure for the last six years has been available on a classic “25th Anniversary” styled card (except for the 2009 “Rise of Cobra” set which was themed to coincide with the film’s launch) and available in two variants: a standard version and a rarer variant which is generally more sought after on the collector market. Starting in 2011, they released the first Transformers/G.I. Joe crossover set, which is continuing into 2012 with another vehicle/driver combination. What started in 2007 as a short commemorative line grew into a hit among Joe collectors. Despite the official end of the retail “25th Anniversary” (or “Modern Era” as it was called by many collectors after the 2007 series wrapped) with Wave 13 in 2009, the “25th Anniversary” lived on in several multi-packs and exclusives, retaining the vintage card artwork and file cards. Besides a few rare cancelled items and retail variants, the SDCC and JoeCon exclusives have commanded the highest dollar, the most money going for the SDCC variants. You see, except for the 2009 Rise of Cobra themed set of two, each year has had a rarer variant packed 1 to every 3 of the “regular” version. Sergeant Slaughter was perhaps the biggest issue when his more popular “TTT” (camouflaged deco that was made popular in the Sunbow cartoon series) version was the rarer variant, which Hasbro learned from and corrected for Zarana the following year, whose more popular classic deco remained the regular release. Which brings us to the highly anticipated 2012 exclusive figure – Jinx. The red-clad female G.I. Joe ninja first appeared in toy form in 1987 and was featured in the animated film. Because she’s one of the few rare females on the Joe team and she was one of the first martial artists in the line, she’s been quite popular with fans and is yet another figure that fans were simultaneously excited to finally see made in the modern construction, yet anguished over the exclusive price it will cost to obtain her. Jinx is also going to be heavily featured in the 2012 sequel to “Rise of Cobra” — “G.I. Joe: Retaliation” — and her film-accurate figure is being released in the main retail line, in a yellow and black scheme. This very same figure is essentially being repainted in red for the SDCC exclusive, and in white “training” deco for the SDCC version — with a new, unmasked head sculpt for the rarer white variant. Where the retail version will make no more than roughly $10 per figure, expect to see the red SDCC version go for upwards of $40 after the convention, and the variant for $100 and up, if not ridiculously higher. Both figures will come on the classic-styled “25th Anniversary” style cards, with matching vintage file cards. While it’s unfortunate for collectors to see fan favorite characters like Sgt. Slaughter, Zarana and Jinx relegated to pricy Con exclusives, they likely wouldn’t be available in any other format. While there are some fans who will never own these figures, thus sadly leaving a hole in their collections, most fans will find some way to obtain them eventually. I’m one of those nutjobs who generally pays the crazy prices up front, but as an OCD nerd, it’s worth it to spend the money up front, as they only get more expensive as the months go by. I won’t lie, I’m not as stoked about Jinx as I was about Sarge or Zarana, and I feel that since Jinx appears in a red uniform in the film, that they could have squeezed her into the main retail line in the red deco as a variant of the yellow/black uniform. But to get her on a classic card, I think this is the only way. And since I’m pretty keen on the vintage artwork, part of me is glad that she’s the SDCC exclusive (that is, the part of me that isn’t my wallet). So back to 2007. The exclusive that year was more geared towards novelty than anything. Based off a rather obscure, wacky deco from the original A Real American Hero line, many fans clamored for the rarer gold version, and many obtained him. I personally found this “Pimp Daddy Destro” to be a hideous figure and wouldn’t take one if you gave it to me. 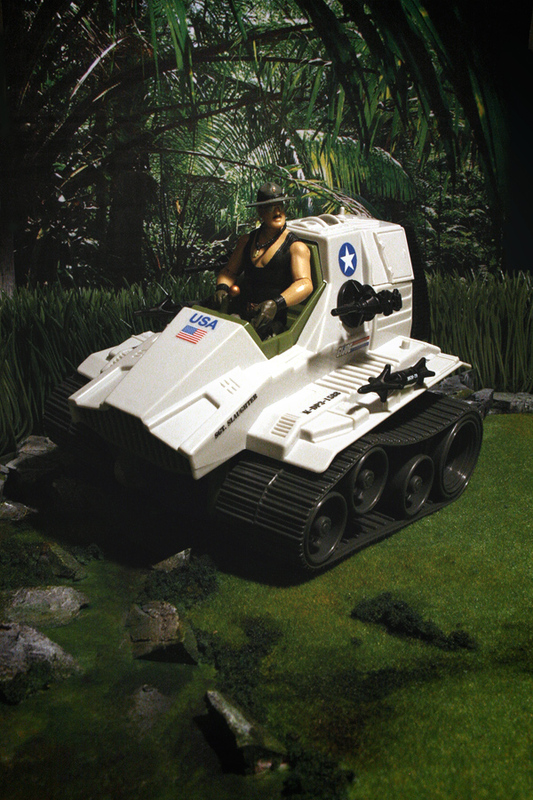 It’s one of the few modern construction Joes that I don’t own, have never owned, nor do I want to own. In either format. Besides its novelty, it’s an ugly figure that is far from a necessary figure. Then, in 2008, the exclusive was geared more towards comic fans. Personally, I feel this year’s figure was perhaps the best fit for Comic-Con exclusives so far. It was a nice comic-themed tie-in figure (fitting, since it is Comic-Con after all), was a main character but not a “must have”, iconic version of him, and it made a really cool display piece. I would’ve preferred getting the rarer variant, but settled happily for the regular deco. This one is another figure that isn’t a must have, but I feel like it’s better suited for a modern Joe collection and isn’t a direct repaint like the previous year’s. The novelty is nice, and it was pretty well-executed (save for the Indiana Jones torso and articulation, which is sub-par for the modern “25th” Joe line). 2009 saw the first live action Joe film, and thus the SDCC exclusive was tied in to the film, not the vintage series. At the time, I wasn’t interested in this 2-pack. I now regret not getting it, as it was a cool set and I will eventually try to track a set down. Instead of 2 variants of the same figure, the “Rise of Cobra” 2-pack saw Destro’s ancestor paired with the modern Destro (or “James McCullen” as the packaging officially states). Both figures were created using new webgear and heads but with previously existing bodies. Anyone who wants a screen-accurate “Rise of Cobra” Destro/McCullen will need this set, as the retail Destro looked nothing like the film character. And then the biggest ruckus yet: 2010 saw the modern return of Sgt. Slaughter! According to the powers-that-be, Slaughter was always reserved for exclusive-status due to the fact that he was based off a real living person, and the rights for his likeness belonged to another toy company besides Hasbro. In an exclusive format, this likeness was able to be used and thus we were graced with the 2010 SDCC Slaughters. This was the first year that the Joe exclusive saw brand-new tooling for the entire figure, and the variant actually wasn’t just a repaint… It had different legs and accessories than the main version! Unfortunately, the variant was the more sought-after version, and many folks had to shell out in excess of $100 for the figure, or go without. Both figures came with entirely new artwork, and was perhaps the best bang-for-your-buck figure so far, and I’ll go so far to say one of my favorite figures. So after Sarge, what do you do to top that? Well, 2011 delivered us Zarana — Zartan’s wacky 80’s punk rocker sister with a mohawk and a 30-year old fashion nightmare. Besides the odd yellow mohawk which I immediately repainted, Zarana was pretty amazing. She was an almost-all-new figure, reusing only lower arms and lower legs from previous figures. The regular version was fortunately the classic pink deco, which came as a relief for fans. And not soon after, Zarana was reunited with her brother Zandar who came out as a BBTS exclusive figure, along with the remainder of the vintage Dreadnoks. Again, both versions of this figure came with different card art: one resembling the classic art, and the “Cold Slither” variant (a nod to the Sunbow cartoon) came painted in black with sassy rocker card art. Most fans won’t be able to complete their Dreadnoks or their 25th collection without this figure, but since she was a female character (and Hasbro has said time and again that “female characters just do not sell well at retail) it was — the same as with Sarge — likely the only chance to get her in fans’ hands. I consider Zarana a must-have along with Sarge, and is a close second behind Slaugther as my favorite SDCC exclusive so far. 2011 also saw the first Transformers/G.I. Joe SDCC crossover set: A 30th Anniversary Skystriker repainted as the Decepticon Starscream, complete with Cobra Commander as the pilot, and a miniature 1:18 scale Megatron pistol. While I didn’t get this set, I admire the idea behind it, and think it was a very cool exclusive, that harkens back to the Cobra Commander from 2008. It was a great comic tie-in; not essential, but a really cool display piece. Also, it was great for both Transformers and Joe fans alike, which made for more competition in acquiring it. And now, back to 2012. 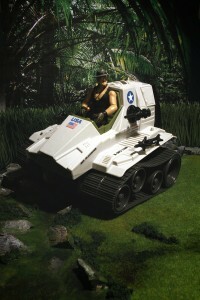 In addition to two Jinx figures, they will have another TF/Joe crossover set: a Cobra H.I.S.S. painted as Decepticon Shockwave, paired with a Constructicon-themed B.A.T. and with Destro. Both items have created quite the stir (as usual) among Joe fans, and like last year, I plan on likely passing up the TF set, but I’m all in for both Jinx figures. In roughly two months, I should have the red Jinx and hopefully her white “training” variant, and will do a review for the site. Until then, check out the pics attached, read up on the YoJoe archives, gnash your teeth if you don’t own the previous exclusives and wait patiently for July to arrive. Good luck, and happy hunting (you’ll need it!). Opinions in this article are that of the author and not necessarily that of fighting118th.com. Promotional photography supplied by Hasbro. Next: Say it ain’t so, Joe!